Let’s Paint a Colorful Ram in Watercolor! Howdy friends! I am not having a live show today, Sarah has to work today and I am trying to learn a new high-definition camera I bought so I can make better quality videos for you. It’s wicked fancy! For now though I have a colorful painting of a Ram with a limited palette for you! I love the challenge of working in a limited palette as well as completely changing the colors of an object. It is a great way to make you rely on the values of an object instead of the color because as long as you have the values right you can use whatever color you like! Thanks for stopping by and til next time happy crafting! 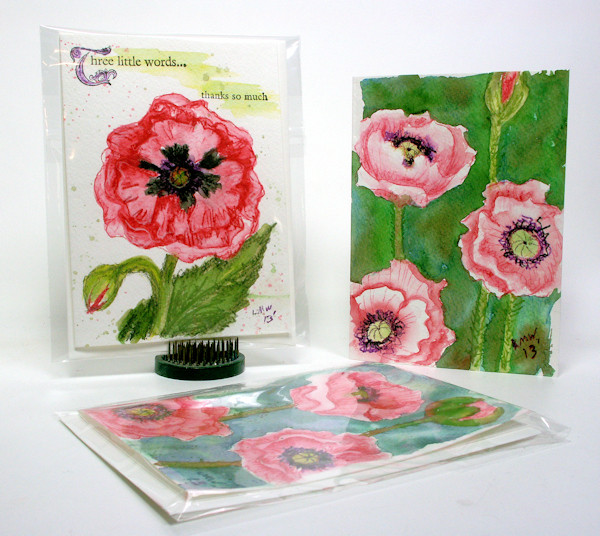 Peonies in Watercolor and Pastel Live 12:30pm ET! Hi friends! 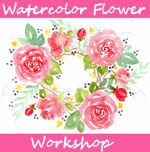 Today we are going to have a good time painting flowers in watercolor and pastel! I like to use mixed media as you can pull in the best aspects of different mediums to achieve the results you want. You can also use these techniques to rescue a painting that is nor working. You can watch the live show or replay in the player below but if you want to chat live be sure to watch on YouTube at 12:30 today. Last Day to get any class for $42 in my online school, use coupon code HB42 to get any class for $42 or 46% off payment plans. It’s my birthday week treat for you! All my classes have lifetime access so you can buy them on sale and take them when you have the time, you can also return to any lesson again and again as much as you like. Below is a rundown of the classes I offer and who they are best for! 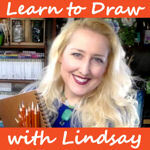 Learn to Draw with Lindsay: This class is designed to teach anyone how to draw without gimmicks. You will learn to draw what you see. 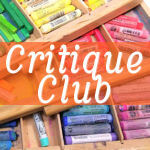 You will learn how to sketch, shade, decipher tonal values and how to apply your new drawing skills to other media. This beginner class is for anyone wanting to improve their drawing ability and contains nearly 8 hours of step by step video instruction. Enroll or learn more here. Essential Tools and Techniques for Watercolor Painting: This class is designed to teach you everything you need to know about watercolor so you can get painting fast. This class is a good foundation for your watercolor studies. In the first part of this class you will learn about supplies, develop techniques and practise the skills you will need to create whatever paintings you desire in the future. In the second part of the class we will put all of the skills you learned into practise as we complete *four beautiful paintings. This class is my most popular course. *This class originally had 3 final paintings but I added a 4th on negative painting. Student always have access to any content added to classes they are enrolled in. Find out more here! 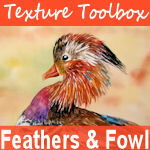 Texture Toolbox: Feathers & Fowl: This class will teach you how to realistically and expressly paint birds in watercolor. We work on capturing the subtle texture and shading in feathers and we add hints of colored pencil to enhance out feathered friends when desired. NEW! I have added an alphabetized bird painting tutorial archive to this class should you want to find past bird tutorials I have done that are not included in this course. Click here for more info or to enroll. Watercolor Flower Workshop: This is my most recent class and it is all about loosely painting expressive flowers in watercolor. Have you ever tried to paint loose and ended up with a hot mess? Well, this class will offer the structure you need so you can create a floral scene from your imagination that is well-balanced, beautifully composed and loose! This class focuses heavily on brush control so it’s good for folks that need help with brush strokes and are curious about some of the odd specialty brushes that are out there. I soon will be adding a wedge brush section to this class! In addition to the all new step by step real-time instruction provided in the course there is also an alphabetized archive of other watercolor flower tutorials for your convenience. Learn more here. I love helping people discover the hidden artistic ability within them and I welcome anyone who want to paint better (and more often) to join one of my watercolor classes! Use coupon code HB42, if discount doesn’t automatically appear, to get any class for $42 (that’s 47% off!) and start creating today! Don’t wait, today is the last day to take advantage of the Birthday deal! Thanks for stopping by and til next time happy crafting! Let’s Paint Pears! Free LIVE Tutorial at 12:30pm ET Today! Hi friends! We have another free live watercolor class for you today at 12:30p, Eastern Time on YouTube! We will be painting pears in watercolor! Here are the colors we will use: Pyrrol Red, Permanent Yellow, Turquoise and Burnt Sienna. We will mix all colors from those 4. The turquoise paint, which is a cobalt pigment, lends itself to lovely texture and granulation in mixes while keeping to color palette soft and gentle. Turner Watercolors (or whatever you have) in Permanent Yellow, Pyrrol Red, Burnt Sienna, and Turquoise *All the colors I am using are in the set of 18 that are on Super Sale right now for $19 (List price $150!) If they sell out they will get more in, you can’t beat the price for this quality. 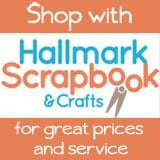 It is a steal at their normal sale price of $29! I hope to see you live at 12:30 on YouTube for this fun class, beginners welcome! We will start off easy with the basics and work further to bring out texture with more advanced techniques. As always you can do as little or as much as you like with your painting:) Happy crafting! 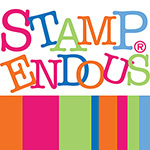 Have a Cupcake & News to Share! Hi friends! Is there anything cuter than a cupcake? I think I need to do a pastry painting series because I think painting them is more satisfying then eating them and hey, no calories! This is fun and easy to paint! Grab any watercolors you have and some paper! You might also find watercolor pencils and a white gel pen handy but if you don’t have them improvise! Watch the tutorial to see how it’s done! Watercolor Paint (any watercolor is fine!) I used Cotman but the Prima sets are really nice and quite a bit cheaper, You can use either the Classics orTropical sets to mix up the colors you need for this. Substitutions: You can sketch on the cupcake with a regular pencil.For the white highlights you can use white watercolor/gouache or acrylic paint, heck, you could probably use white out or white nail polish but I don’t know if that is acid free LOL! The importing thing is that you find some time to paint, you are worth it! 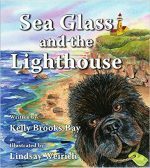 I have been asked to teach a class for Life Book 2017 at Willowing.org! I am so excited an honored to be included with the other amazing artists on board. More info about this later this month! Crazy huh? I am so excited to be a part of this year-long art class, I will be doing a new mixed media art journal page, I can’t wait to start creating it! Well, that’s it for today! I’ll have a stamping tutorial for you tomorrow (it is up on YouTube already if you need an early fix LOL) so until then happy crafting! Let’s Paint an Orchid Together! Hi friends! Today we are going to paint this orchid! I was so happy to see it in bloom again, surely it is a sign of spring right? I will show you how to draw the orchid in the video but if you prefer to have a pattern I have a similar orchid illustration in the Fancy Flowers digital stamp set. I sketched the picture with a yellow watercolor pencil and I also used my new Golden Qor watercolors. If you don’t have any watercolor pencils you can sketch lightly with a pencil and when it comes time to do the veining on the orchids you can use a thin liner brush and paint but you need to let the petals DRY completely first instead of working on the wet petals with the watercolor pencils. I used Prima watercolor pencils but any brand is fine. I hope you try this lesson. 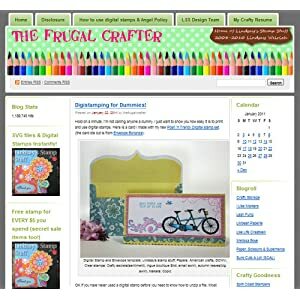 Several viewers who saw the video on YouTube already have shared their beautiful paintings with me on TheFrugalCrafter facebook page and they all turned out so nicely. I love seeing the painting you have made, it touched my heart that you would take time out of your day to watch my videos and make a painting or project that I designed. I also love you guys supporting each others creative endeavors. 🙂 Thanks so much for spending some of your day with me and til tomorrow happy crafting! Let’s Paint Magnolias in Watercolor! Howdy folks! Magnolias are one of my favorite flowers so I was happy to create this painting tutorial when it was requested. 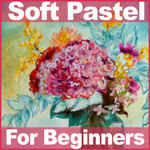 Here I will show you how to draw and paint them…don’t we all need a bit of springtime right now? If you have any questions just let me know! Remember the best way to learn to paint is to paint! Don’t worry about failing, it’s only a piece of paper and nobody has to see it if you don’t want them too. Even if you are unhappy with an attempt don’t toss it yet, it always improves with age, I think the painting fairies visit at night and spruce it up a bit because it always looks better in the morning! Thanks for stopping by, stay warm and til next time happy crafting! A Tale of Two Poppies: Beginner Watercolor Videos! Happy Friday folks! Sometimes (ok more often than that) I shoot a tutorial and afterwards I think “will this benefit anyone?” and “Will people like it?” because something in the work leaves me nonplussed. I usually end up uploading the tutorial anyway because I find there is something “new” that someone will learn from it. That is the case with the first poppy video I filmed, it’s the single poppy card, so I tried the technique again with softer colors and liked it much more. I asked folks during my koi freebie video yesterday if they wanted to see take 2 on the poppy and they did so I have both videos up for you today! Since I know someone will ask 2 of the cards are in the 6″x9.5″ clear bags that I package my cards in for sale, you can get them at Papermart. Here is the first poppy, After it was done I thought my poppy was too low on the card so I added stamping and a swipe and splatters of color to balance it out. The stark white background was jarring. 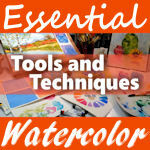 This tutorial is mainly watercolor pencils and the 2nd can use watercolor pencils or regular watercolor paints. I hope you enjoy the video! Which card do you like better? The point of today’s lesson is that there are many ways to paint the same thing. Use the materials you have on hand. A viewer asked me if she could use watered down acrylics to do my tutorials with. I say “why not?” There are some techniques that will not work like lifting out color after it has dried but for other techniques it will be fine AND as a bonus you just learned a new way to use what you already have! Getting new supplies is fun, I get it (I do it!) but there is nothing like the pride you feel when you are resourceful with the supplies you have! Thanks for stopping by and til next time happy crafting!